Line Of Duty’s closest American cousin would probably be The Wire. It’s not nearly as eloquent, but volatile relationships between the characters, a focus on institutional dysfunction, and the moral ambiguity of authoritative actions are at the heart of this police drama, a BBC drama making its American debut tonight on Hulu. Often we don’t get to experience the complexity of our world except in hindsight, when a show like Mad Men can spin out a whole world, complete with all of its ignorance and contradictions. Line Of Duty makes an excellent effort at modern British life. It does fall short in places, but I give it a lot of credit for trying. One of the première’s most interesting plot devices is that there's almost no backstory given that isn’t shown on-camera. This is not a show where two characters have an “establishing” conversation about the one character’s recent breakup and the other character’s new job. Instead the lens is aggressively journalistic. What you see is what you know, and that’s it… which can be frustrating. The first half of the pilot is a collection of these scenes, following three seemingly unrelated police officers. The direction seems vague at best, and getting to the point where you understand the scene takes a long time. But then at about the twenty-minute mark, the show takes off running and doesn’t look back — and that is when, I think, the strength of this approach becomes clear. It’s a show that becomes addictive precisely because you don’t really know what’s going on — like Lost, or even Game of Thrones. There is this idea that we’re seeing what we’re seeing for a reason, but that reason is not always clear — which means you can read whatever you want into some of the scenes, because the characters’ motivations are yours to guess. That is fun. I like that a lot. Because it puts a lot of faith in the viewer. And if the writers know what they’re doing, the viewer can reap a lot of rewards. There was more than one a-ha moment in this episode: moments that only exist if you’re paying close attention, or if you have an opinion about something one character said and let it stick in your brain and then find a moment where that character’s statement is completely contradicted. It demonstrates careful thought and even more careful narrative construction. 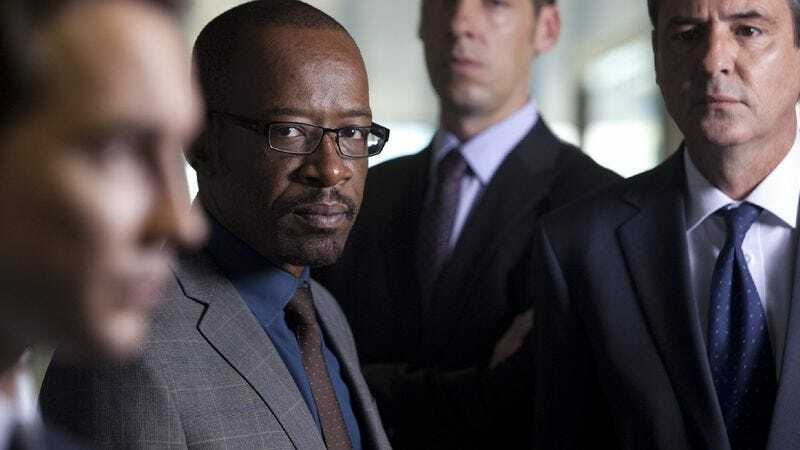 In the end, Line Of Duty chooses atmospherics and narrative over verisimilitude, so at times it seems like we’re being bludgeoned with “true” statements about the role of race in bureaucracy, for example. And even unbelievable — do superiors really tell junior cops to shelve cases so blatantly? No doubt it suits the viewer more to believe that police officers never cut corners on investigations because of staff reductions or extra paperwork, but at times the inefficiencies portrayed begin to look suspiciously over-the-top. The show begins to look like anti-federalist propaganda, designed to poke holes in our faith in government. But, while Line Of Duty reflects disillusionment with the institutions that police us — the checks and balances that are supposed to enforce the morals of our society and instead become cogs in a bureaucratic machine that can be manipulated to ill purposes — it also graciously refrains from bitterness. The system is flawed, as are the people who run it, but rather than judge those people, Line Of Duty shows just how complicated a landscape law enforcement is — and more, how complicated the idea of justice is, in a world that is predicated entirely on meting it out when appropriate. Where Line Of Duty differs most from other shows I’ve mentioned is its abbreviated cast of characters, though this could be something that changes as the show progresses. Right now we have only really begun to understand three characters — all police officers involved, it turns out, in the same corruption investigation. Steven Arnott resigned from the counterterrorism unit on a matter of principle and got reassigned to anti-corruption; he’s an underling investigating the officer of the year, not an enviable task. Tony Gates is the man being investigated — a detective who solves more cases than anyone else by inventing charges to tack on to the same investigation, or laddering. He’s also covering up his mistress’ drinking habit, and that means also covering up that she might have murdered one of her employees. And Kate Fleming is a lackey in a low-level job in Tony’s unit, crime investigation, but in this episode he makes her part of his investigative team. Late in the episode it is revealed that she is working undercover for anti-corruption, also working to bring Tony Gates down. But this quick plot summary does not really do justice to the complexity of the characters, who all grapple with wrong versus right in multiple scenes. Tony is stuck making many difficult decisions, and at various point Steve defends Tony’s actions, arguing that he’s a man just trying to do his job. Kate is always maneuvering around her superiors in crime investigation, trying to do the right thing and being stymied by paperwork and politics. As she gets closer to Tony, she’s also more likely to begin to see the merit of his work. What emerges is that all three are people more or less trying to do the right thing. But the differing paths they take lead them to collide with each other. Their confrontations with each other are essentially the central premise of the show. This is borne out by the high-caliber relationships between these three characters, and their relationships to the other officers and the people in their own lives. Nothing is simple, but nothing is overwrought, either. Steve asks Kate out, because, of course he does. Gates takes Kate under his wing. Kate doesn’t trust Steve’s dedication to the cause. They’re often subtle actions, but together create a multifaceted whole. And at no point does the show fail to provide context. Gates is a black man, Steve points out to his superiors. Is it a good idea to go after a person of color? Aren’t we victimizing him? Kate swallows her pride when she sits down to drinks with Gates’ team for the first time, ignoring the subtle sexist jokes that assault her. It’s a complex world and there’s a lot going on. Interestingly the overarching plot of the pilot, involving Tony’s mistress’ car, was much less interesting than discerning the motivations of each character. That suggests that the show could even improve, as the audience gets to know the characters more. Either way, it is well worth watching. “I’m one-quarter Romany!” was one of my favorite moments. I’m so happy that Steve asked out Kate on a date, like a normal person does when they’re attracted to someone, instead of the ridiculous romantic tension that usually dogs television shows. Tony’s mistress Jackie, played by Gina McKee, is totally the woman in the wheelchair from Notting Hill, in case you were wondering.